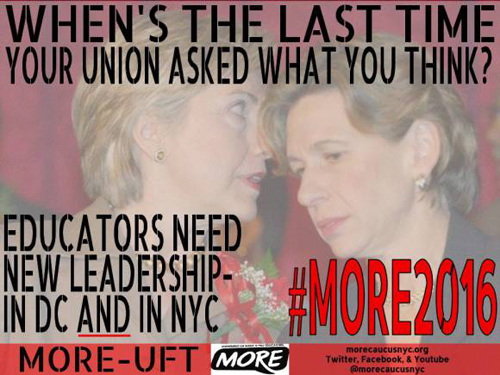 While many in the Chicago Teachers Union were still discussing a response to the national announcement that the American Federation of Teachers was endorsing Hillary Clinton's bid for the Democratic Party nomination for President of the United States, New York City's MORE caucus was taking action. It is fine if AFT President Weingarten is personal friends with Mrs. Clinton, but that is not a reason to give away our endorsement. The last twenty-five years of political endorsements have not helped our union or our schools, in fact, we could argue it has done further harm. They could have engaged the membership in a vibrant discussion on strategies and whether political endorsements are in the best interest of those we serve. AFT could have surveyed every member via email, held town hall meetings in all of the locals and throughout New York City with UFT members and parents like we did in the battle against Cuomo�s anti-education policies. MORE points out the problems with the process: well and good -- we've saw similar problems with the endorsement process within our own union this past election cycle. But we should also point out that Clinton is a Democrat and an enemy of working people. She is in the same party as Obama, Emanuel, as Arne Duncan. She will not defend public education, she will continue the policies of the ruling class against us. And, in her capacity as Secretary of State, she leads the US state apparatus in violent repression around the world in the name of US imperialism. Just as with Chuy, we should point at the undemocratic process AND the anti-working class politics.